It’s nice to change up eggs and frankly, I get bored of the same-old of anything. I’ve eaten eggs in more different ways in the last 2 years than in my entire life. I hardly ate eggs in India because it wasn’t as easy to get them. For that reason, I still don’t eat a lot of eggs, but having an egg-loving husband changes everything. I like the egg flavor best if there is something else more flavorful to counterbalance it. Hence my eggs are always loaded with vegetables and herbs or spices. Eggs are best eaten in moderation, anyway; I never understood the 3-egg omelette! 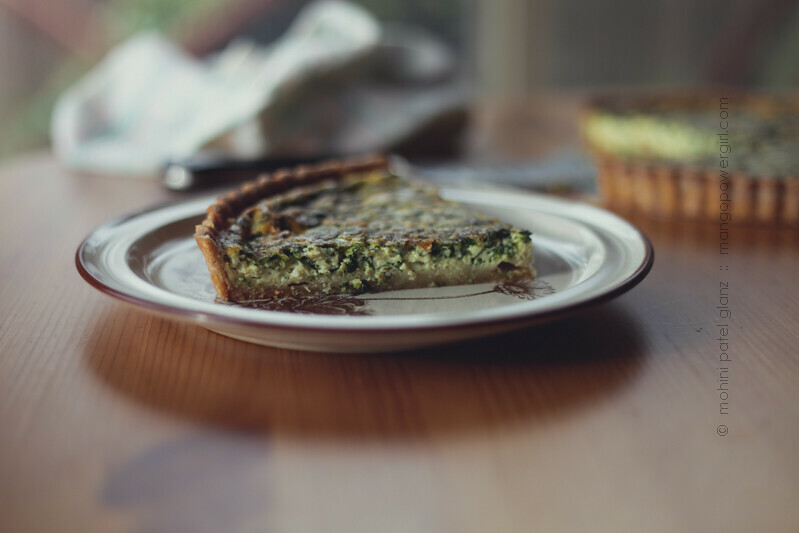 Quiche is something I’ve almost always had from a bakery, and only recently starting making at home. 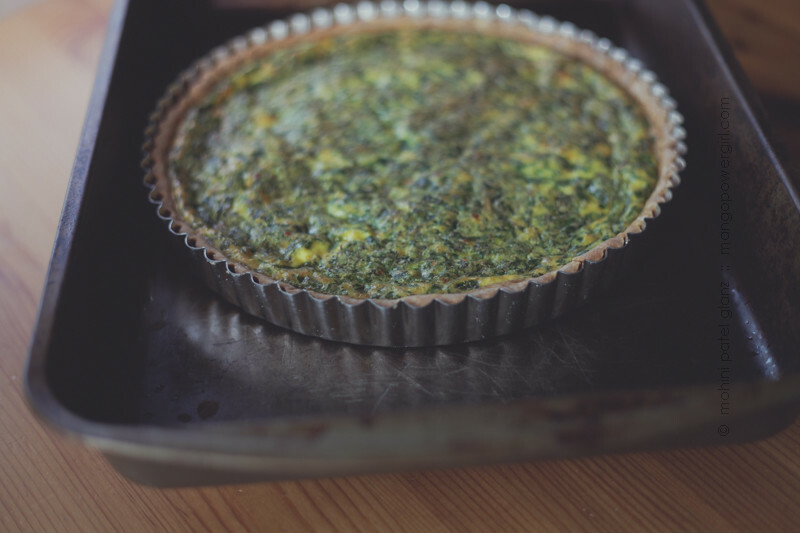 Partly I started baking more at home because it’s economical and partly, because once you start making pies from scratch, quiche seems like a piece of cake 🙂 I make a couple of pie crusts when I do make them, then one can be a pie and another one a quiche! 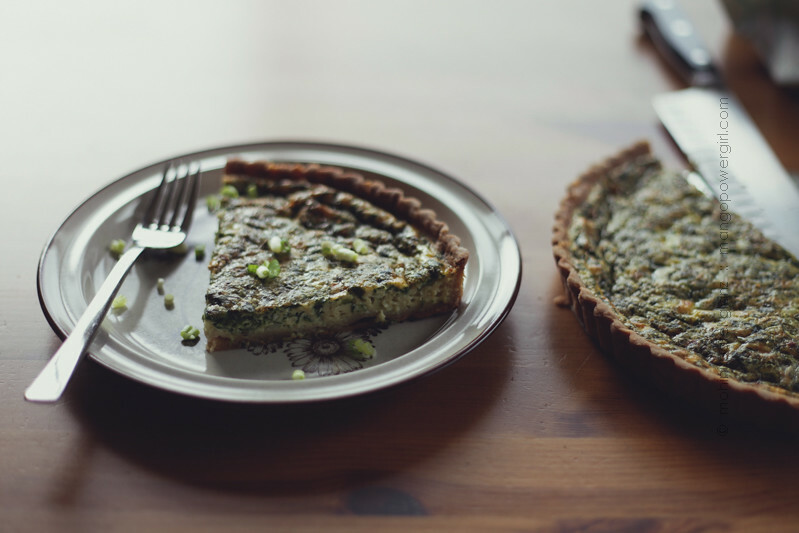 Although I managed to photograph the most uninteresting-looking quiche this time, I have to say the flavor is otherwise. This one is with spinach and green onions, spices, and without cheese — nice and simple! Some of our other favorite combinations are potato & chard, mushroom & leeks, and pretty much whatever is in season or available in the fridge! 2. Roll out the crust in a pie or a removable tart pan, and blind bake. I like the inside of the crust to look slightly crisp and golden brown. Cool the crust completely! 3. Quick saute the spinach, garlic, chili flakes, and half the scallions in oil and let it cool as well. 4. Beat the eggs, milk, spices, and cooled spinach mixture. 5. Fill the crust carefully and slide into the oven. If you have a thin removable tart pan like mine, it’s nice to use a larger baking sheet to hold the pan, so there are no spills in the oven. 6. Bake for about 25 minutes, reduce temperature and bake until the egg mixture is set. It usually puffs up when done, and will settle down when you turn the oven off. 7. Let it cool slightly, cut, garnish with more scallions, and serve while it’s still slightly warm. 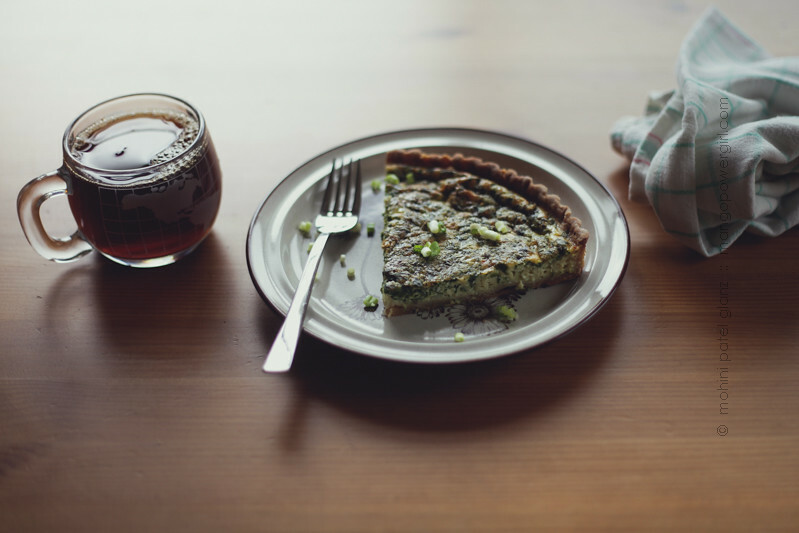 A last slice of quiche!